A warranty deed is a legal document used to transfer, or convey, rights in real property from a grantor (seller) to a grantee (buyer). This type of deed provides protection for the grantee by confirming that the grantor holds clear title to the real estate, has the right to sell the property to the grantee, and he or she will warrant the title against all persons whomsoever (Iowa Code 558.19). This guarantee extends throughout the property's history. The grantor also warrants that they did not encumber the property in a way prohibiting transfer, and that the deed references all easements, restrictions, or other agreements of record that relate to the specific parcel of land. A lawful warranty deed includes the grantor's full name and marital status, as well as the grantee's full name, marital status, mailing address, and vesting. Vesting describes how the grantee holds title to the property. For Iowa residential property, the primary methods for holding title in co-ownership are tenancy in common and joint tenancy. A grant of ownership of real estate to two or more unmarried persons is presumed to create a tenancy in common, unless a joint tenancy is specifically created (557.15). A transfer to a married couple vests as a joint tenancy, unless otherwise stated (557.15(3)(a)). As with any conveyance of real estate, a warranty deed requires a complete legal description of the parcel. Recite the source of title to establish a clear chain of title, and detail any restrictions associated with the property. Include the complete legal description for the subject property, as well as its physical (street) address or common name and the derivation of title. Additionally, the form must meet state and local standards for recorded documents. 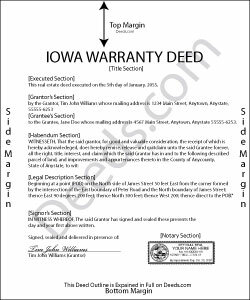 The grantor signs warranty deeds in Iowa. The acknowledgment of the deed, whether made within the state of Iowa, outside the state, outside the United States, or under federal authority, should comply with the provisions of Chapter 9B of the Iowa Code. Once acknowledged, the deed should be recorded in the recorder's office in the county where such lands are located. Include all relevant documents, affidavits, forms, and fees with the along with the deed for recording. Confirm the necessary materials with the local recording office. This article is provided for informational purposes only and is not a substitute for legal advice. Contact a lawyer with questions about warranty deeds or for any other issues related to the transfer of real property in Iowa. Sandra G. said: We were referred to the site by banking friend. It does take time to read through and figure out what a person needs, form-wise, to accomplish the goal. Once that was decided, check out and the download was very easy. What a great savings in cost and time. Reply from Staff: Thank you Sandra, glad we could help. Also, please thank your friend for us. Have a wonderful day. Lorrisa L. said: No review provided. Reply from Staff: Thank you for your rating. Have a great day! Susan S. said: Very quick, easy and readily available forms. No wait, no advertisements, no pressure to purchase MORE. I expected to only get part of the information I needed, and for there to be a hidden cost to get the complete package, but surprisingly, I got immediate access to all the forms I ordered, AND THERE WERE NO ADDITIONAL HIDDEN COSTS! How refreshing! Reply from Staff: Thank you Susan, we really appreciate your feedback. Robert S. said: The cost was well worth it. It was very easy to download, fill in the necessary information and then print the deed. I filed my need deed today and everything was complete and accurate because of the example you provided. Reply from Staff: Thanks Robert, we appreciate your feedback! Jearsel W. said: I was surprised how helpful the completed example was. It was nice to see what the form should look like when it is filled out. Great job! Reply from Staff: That's wonderful to hear Jearsel, thanks for your feedback. Have an awesome day.